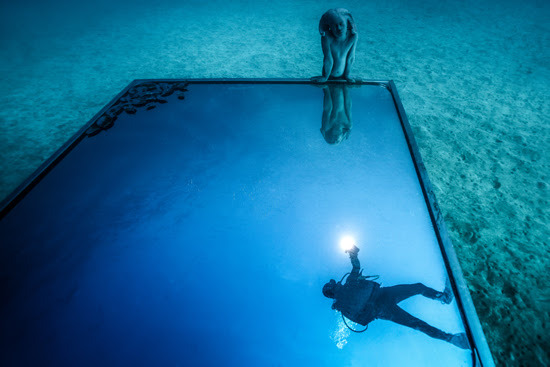 Sculptor Jason deCaires Taylor has created an incredible project "Museo Atlantico" in Lanzarote, Spain. It is a timely and important work. Rarely do we see the worlds of art and science combine with such elegance and grace. His works are modern underwater mandalas. Over time they will dissolve and become home to coral and create new habitats for fish and sea life. What is truly remarkable is that the new coral create new art. The transmutation of a human idea melds with natures own. As our oceans are under duress from pollution, tourism and overfishing, Jason's art is both problem solving and breathtaking. He is featured in the BUILD issue and you can see many of these works prior to being sent to the bottom of the ocean. Put on your goggles and take a dive.